There are definitely some positives to being single and one of them is being able to cook exactly what I want when the kids are with their Dad. Mushrooms were always a no-no in our house, especially anything that resembled a wild mushroom, so I sadly forsook my beloved fungi to cook family friendly dinners. 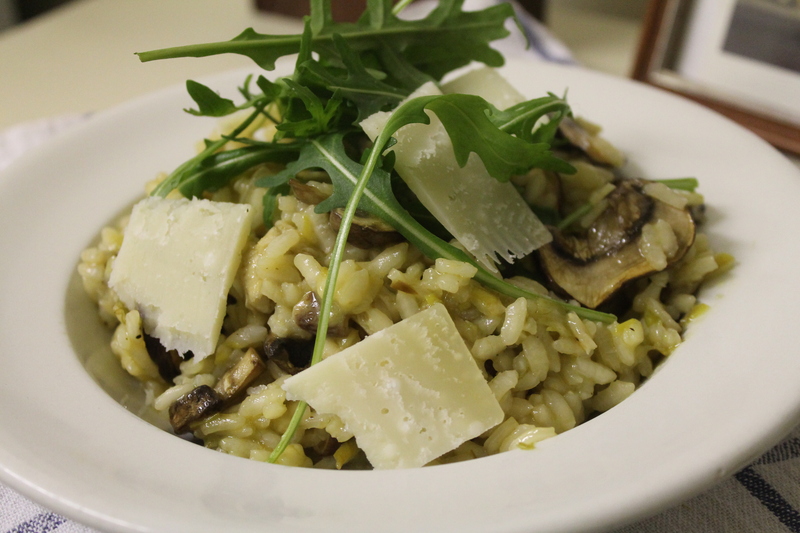 One of my favourite dishes is mushroom risotto ( well, I love all risotto really…its one of my top ten comfort foods). Imagine, lovely oozy, buttery rice with the deep earthiness of wild mushrooms. I also love leeks, another pet hate of the children, especially the teen..although the littler kid will tolerate them blitzed to a pulp in soup, if he has to. So now when I’m on my own I revel in the opportunity to savour my new favourite mid-week supper which combines leek, thyme and mushroom (dried wild and organic chestnut). A lot of people seem afraid of making risotto. Its one of those dishes, like panacotta or meringue, that seem far more complicated than they actually are. It only requires one pot (so minimal washing up) and if you stick a couple of simple principles you can’t go far wrong. 2/ Let it rest for 5 minutes before you serve it. The residual heat of the pan will keep the rice cooking, so even if you think the rice is a little underdone, it will be utter perfection by the time you serve it. 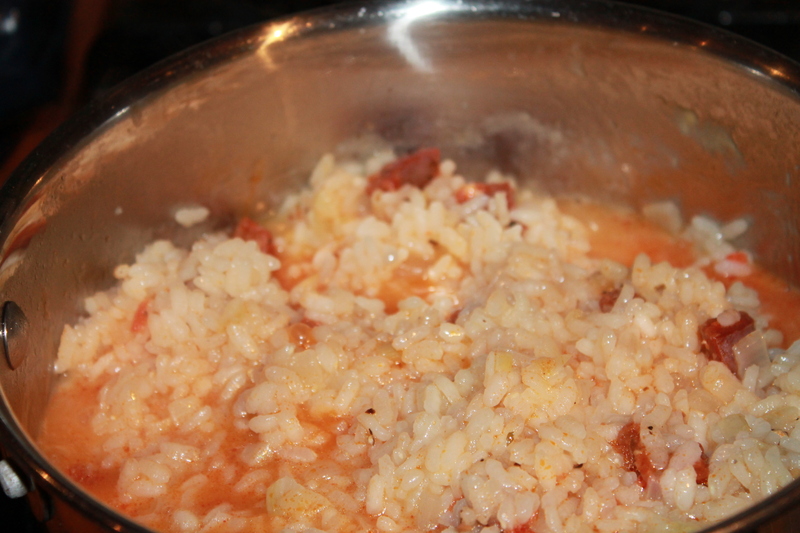 3/ A good risotto is nice and wet. Theres nothing worse than hard, dry rice or rice that isn’t thickly coated in a rich, buttery, deeply savoury sauce. Having said this you don’t want it to resemble rice pudding. The trick is to keep adding hot stock, stirring almost continually until its absorbed by the rice, then add a little bit more. I find that recipes are often wrong and inevitably you need more than stated. Even if you think you’ve added too much it will mostly absorb as you leave it to rest. 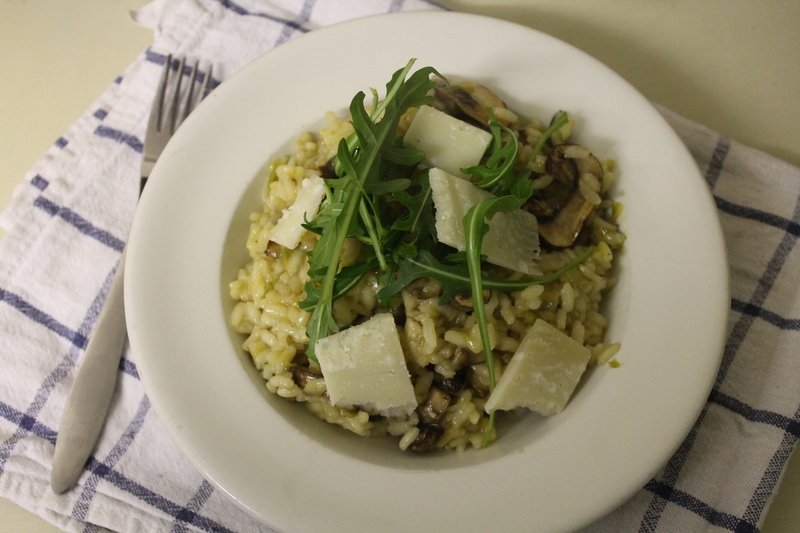 Another trick with this risotto, and any dish that includes mushrooms, is to slice and dry fry them before adding. I learnt this recently from friend, colleague and former Jamie Oliver Fifteen cadet, Tom. He cooked me an amazing risotto explaining that dry frying the mushrooms helps seal in the flavour, and by only adding them to the risotto when cooked it also prevents them turning mushy and formless. He’s right of course, he knows his stuff and this is a tip I have followed ever since. half a dozen wild mushrooms, fresh or dried. I used dried shiitake, rehydrated for 20 mins in hot water them roughly chopped. If you are using fresh mushrooms slice and cook them in the same way as the chestnut mushrooms below. Heat the knob of butter and olive oil in a saucepan. Add leek and cook gently until it begins to soften but not brown. 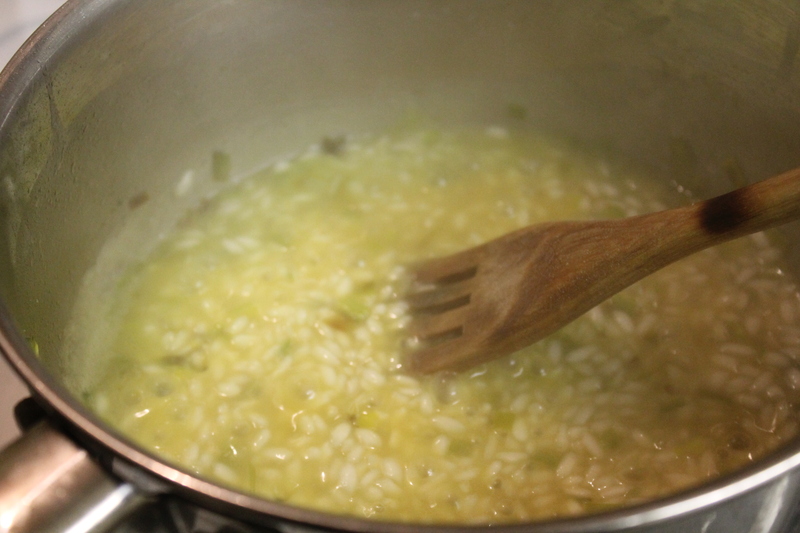 Add the fresh thyme and rice and stir for a couple of minutes until the rice begins to turn translucent (i.e. it no longer looks so chalky white). Turn the heat up a fraction and add a glug of vermouth. Within a minute it the rice will absorb it and there will be little alcohol left. Begin to add the hot stock stirring frequently until the rice has absorbed most of it, then add more. Keep doing this until the rice has absorbed most of the stock (you may not need it all, or you may need a little more depending on how much rice you have used) and has reached the desired al dente point. 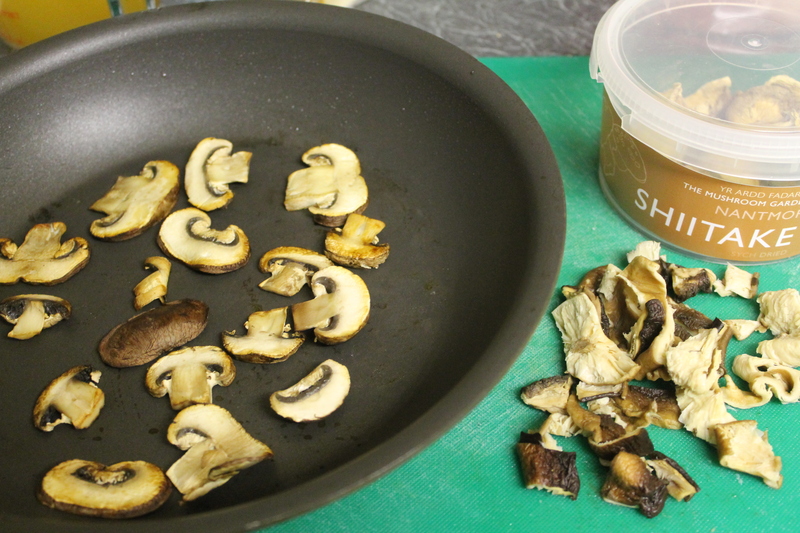 While the rice is cooking heat a non-stick frying pan and when hot add the sliced mushrooms in one layer. Cook until beginning to brown then flip over. Remove from the heat and keep to one side. Once the rice has reached the al dente point add the dried and rehydrated wild mushrooms, the remaining 25 g butter, the mushrooms and check seasoning adding plenty of black pepper. Remove from the heat and allow to rest. If you wish to top with a few slivers of parmesan that’s ok, but it doesn’t need it. Finish with a handful of fresh peppery rocket; it will help make you feel virtuous that you are at least attempting some greenery with your bowl of rich buttery comfort food. Travelling here, there and everywhere is unsettling at times. It always takes me a while to get acclimatised once back at home and despite finding cooking remarkably relaxing and therapeutic, I often struggle to get back in to the familiar groove of daily routine, family meals and planning shopping. 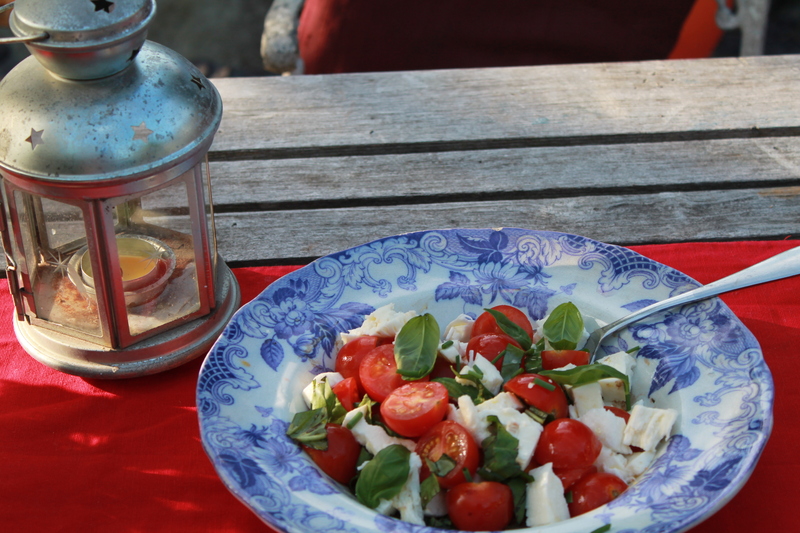 Instead I crave quick, easy suppers with limited washing up and preparation time, often using whatever I have in the store cupboard and not go charging about to the supermarket. Add to my current state of de-stabilisation a large dose of stress, a sudden influx of work and if I’m honest I just want to hide away. I am juggling the desire to eat well with a severe lack of creative energy. I want to be cooked for, or at least if I have to cook I want to be able to rustle up something that’s quick but also delicious, comforting and soothing. A recovery dish. If I’m looking for comfort food then risotto is one of my favourites. Deep, intense, savoury flavours, but also rich and satiating. Laden with cheese and butter, with a hint of wine or vermouth. I love all risotto, whether it be full of parmesan, seafood, a gorgeous mushroom one cooked for me by a lovely friend, or a kid friendly one that my daughter loves with chicken, fresh herbs and a dollop of mascarpone. Once, when I was still working as a researcher I stayed in Oxford for a week. Life can get lonely when you go away to work, so my trick was always to find a good restaurant and a friendly bar. 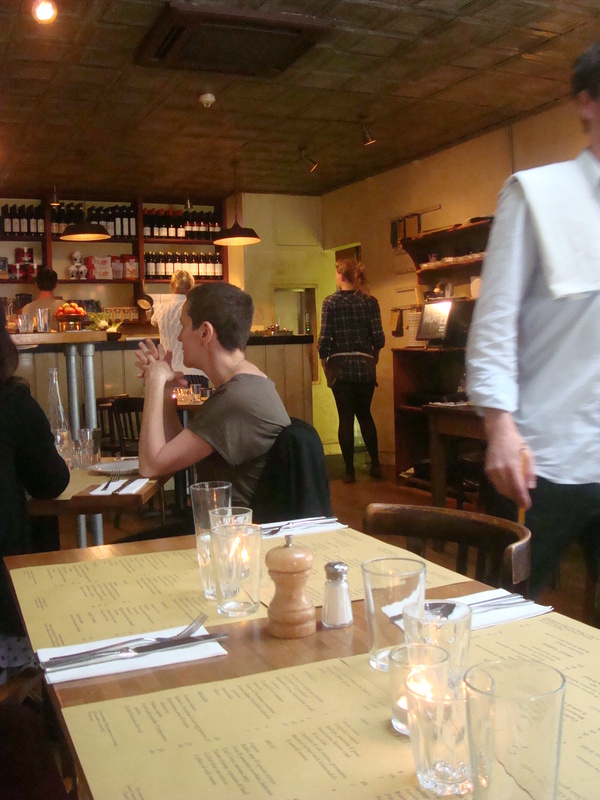 The restaurant I found in Oxford was Branca, a popular Italian on the edge of the trendy Jericho district. With welcoming staff and no urge to usher me out the door I often lingered over my evening meals, plus it was the place where I ate the best risotto I have ever had. I can’t to this day work out what made it so good….I know it had masala in it and finished with perfectly cooked scallops. It was so good I ordered it three nights in a row. I haven’t been to Oxford since so have no idea if they still make it, but the memory stayed with me. My festival recovery risotto was less glamorous, but no less tasty. 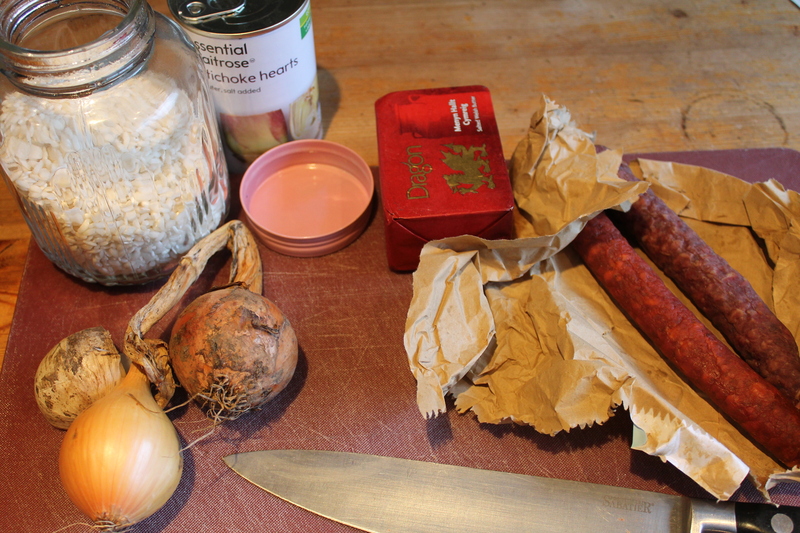 Chorizo is another favourite and armed with my stash from Trealy Farm a tin of artichokes I found in the cupboard, and some left over parmesan I set to cooking. Melt the butter and oil in a large pan and add onion. Sweat without browning for about 5 to 10 minutes or so. Add the garlic and rice and stir well to coat. Cook until the rice begins to turn slightly translucent (about 5 minutes) then turn the heat up a little and add the vermouth. Allow to bubble until the vermouth has almost been absorbed into the rice then begin to add the stock a ladle full at a time, waiting until it’s totally absorbed before adding the next. It’s not necessary to stir continuously, but it is important to stir or shake the pan frequently to make sure the rice doesn’t stick and the starch in the rice has broken down. You may well run out of stock; if you do just add a little boiling water, but don’t over do it. You are looking for the rice to be ‘al dente’, soft, but with a bit of bite which should take about 15-20 minutes. If you want it softer just cook for another 5 minutes, but don’t overdo it. In a separate pan heat a little oil and when hot chuck in your chorizo. Fry briskly until just beginning to crisp then remove with a slotted spoon and add to the risotto. 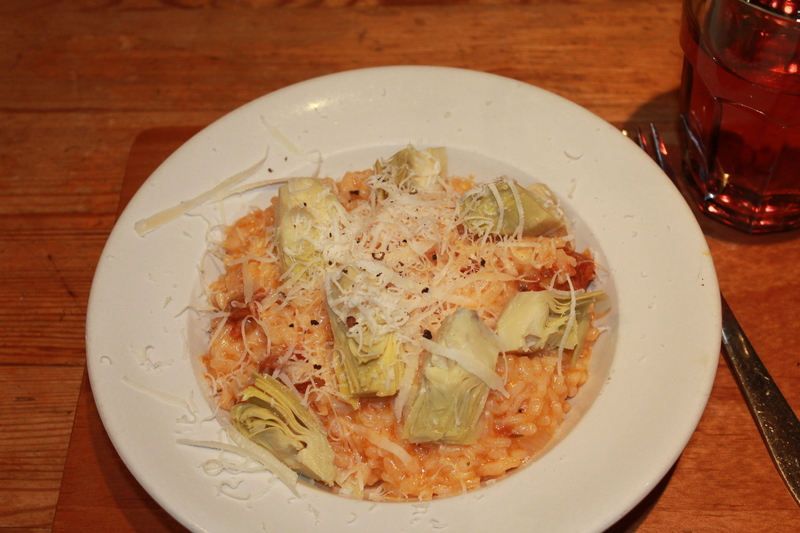 Turn off the heat and add another knob of butter, the grated parmesan and the artichokes. Check seasoning then put a lid on the pan and allow to rest for a couple of minutes. I remember the days when my mother cooked us ‘exotic’ dinners. It was the 1970’s and early 80’s and she was experimental for the time. She didn’t entirely leave behind the post-war and rationing traditions of her parents generation; everything laced with a generous amount of butter, cheese and cream, but because she’d travelled widely and liked to cook she took inspiration from the food encountered on her trips around Europe. Later, when she married my step-father more cross cultural traditions entered the house. He grew up in Trinidad to a white family who held on to their British heritage, although he much preferred Caribbean food and company. Rum punch entered our lives, as did cauliflower ‘Roman’. We lived on the local council estate where our decidedly ‘middle class’ diet and eccentric ways were something of a novelty in the street. From the books that lined our walls to the high brow discussions that took place over the dinner table our upbringing was not financially rich, but was eclectic and intellectual often leaving friends somewhat bemused when they came to visit. 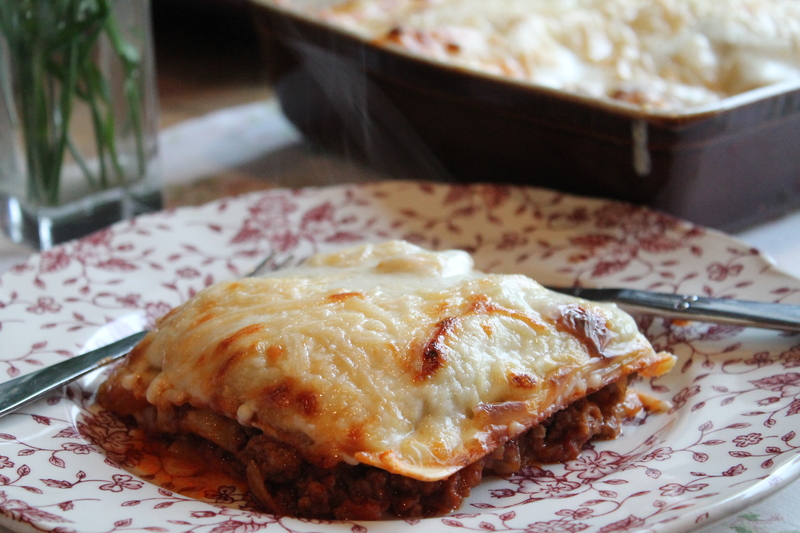 One of my favourite dinners was a simple plate of home-made beef lasagne. This dish, along with moussaka, crepes stuffed with mediterranean vegetables and parmesan, and her famous ‘Saturday chicken’ are meals inextricably linked to my teenage years. They remind me of a time of food discovery, experimentation and a bustling house. Mum’s lasagne would have given any Italian cook a run for their money. It consisted of dryish layers of deliciously thick and tomatoey bolognaise sauce, alternated with layers of bechamel, dried pasta blanched in plenty of hot water and finished with plenty of parmesan cheese. Mum’s was not the lasagne of the traditional British cook or supermarket. It wasn’t falling apart and the sauce didn’t run off the plate (although as a teenager I rather liked it like this, not caring a jot for authenticity and happily mopping up sauce with crisp lettuce and cucumber slices). Mum made a good lasagne which improved after it had stood a while, or the next day. Much to the horror of my waistline my love for rich, sauce laden dinners has stayed with me (although these days I try not to cook them so much as I’m less able to burn off the pounds in the way I did as a teen). 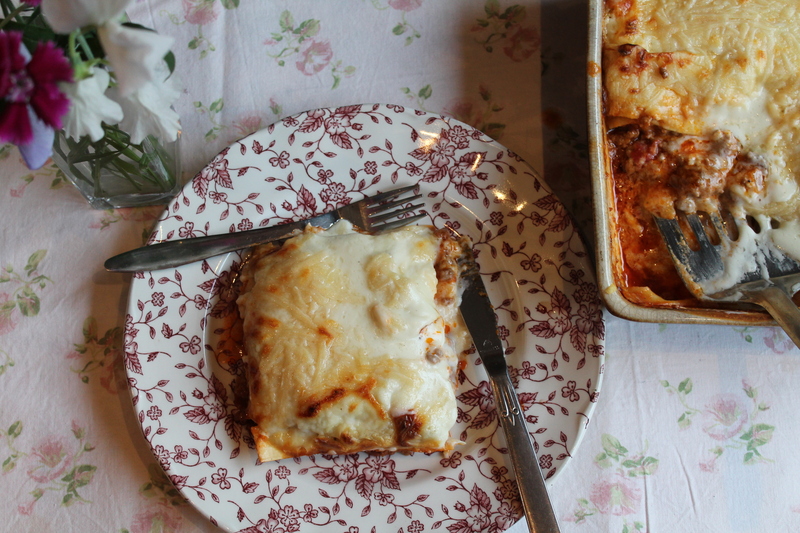 The simple lasagne however holds special memories of those loud communal dinners, evoking warm, safe feelings that only comfort food from childhood can. Its one of those dishes I crave when I need a carb hit, or if I’m a bit under the weather. Over the years I have made different versions of lasagne. In my vegetarian days I regularly made vegetable lasagne with eggplant, courgette, peppers and tomatoes or even a mushroom, tomato and ricotta concoction. My favourite layered spinach with tomato sauce, mozzarella and ricotta. I didn’t mind the these variations and much prefered them to the version my daughter got me to make with chicken or turkey mince (for the teen who won’t eat beef). In he end though there is always a bit missing from the jigsaw. The pieces just don’t fit together in the way a simple, traditional beef bolognaise and bechamel do. Here is my tried and tested version. Heat the oil in a large frying pan. Gently fry the onion until almost soft hen add the carrot and cook for another 5 minutes. Add celery and garlic and continue to cook. 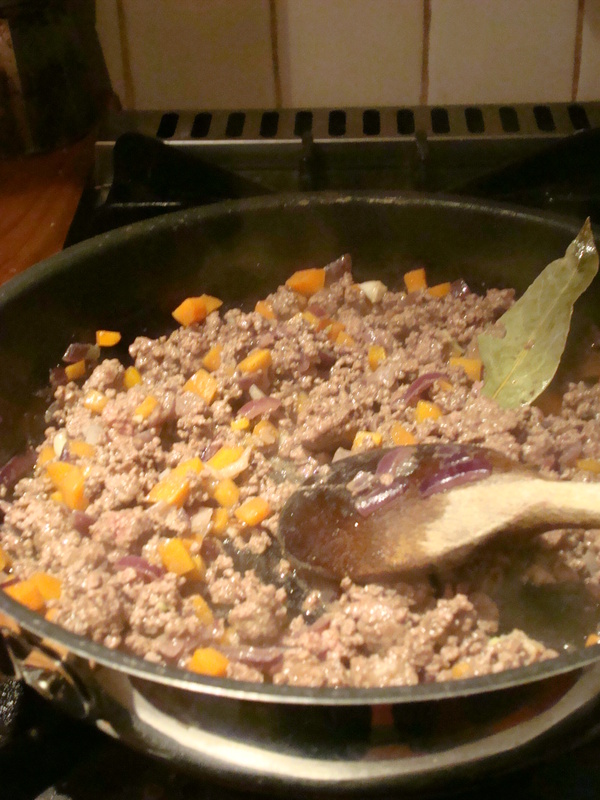 Add the mince and turn the heat up a bit to brown it (5 to 10 mins). Add the wine and allow to bubble until it reduces a bit then add the tomatoes and stock. Season with salt, pepper and simmer gently for about an hour. It should be almost dry by the time it’s cooked. To make the bechamel sauce melt the butter in a medium pan, then stir in the flour cooking for a minute or two. Remove from the heat and gradually add the milk stirring into the butter/flour paste well. When it’s all mixed return the pan to the heat and cook gently until it comes to the boil and begins to thicken. Stir continually so it doesn’t turn lumpy. Season well with salt and pepper. 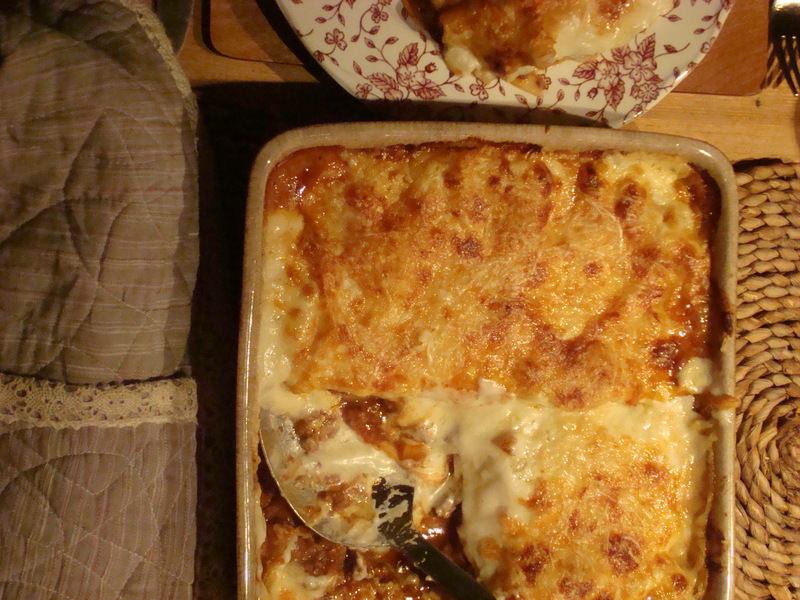 To assemble the lasagne, take a deep, wide dish and coat the bottom with about a third of the meat sauce. Add a layer of pasta then a layer of bechamel, then another layer of sauce, pasta, bechamel and finish with a layer of pasta. Pour over the rest of the bechamel and sprinkle over the cheese. Cook in the oven for 40 minutes, until golden brown and bubbling. If you have time leave the lasagne to rest for about 15 minutes before serving. NB. If you but dried lasagne that needs precooking, bring a large pan of salted water to the boil and add a couple of drops of olive oil. Add a few sheets of pasta at a time blanching for one minute or so. Remove with tongs and leave to dry on a tea towel or plate before using in your dish. I didn’t wait to let my lasagne rest. I was too hungry. But it holds together even better if you are patient. I’ve never had much luck with my pasta making exploits. A couple of attempts at making tagliatelle, plus a few goes at making ravioli have left me slightly frustrated and wondering what I was doing wrong. My pasta either ended up soggy and claggy, a sticky mess…or too thick and a bit rubbery. Even when I was given a pasta machine last Christmas I couldn’t get it right so I’d given it up as a bad job. My attempts at pasta making have left me frustrated, but I’m not easily beaten, especially by a lump of dough so I got reading. All the pasta making tips, videos and recipes I could find. They all made it look too damn easy, when I knew it wasn’t!! But then I found a recipe in Yotam Ottolenghi’s book Plenty which sounded really simple. None of this “roll out fifty times at each thickness on the pasta machine” just simple clear instructions that left even me feeling confident I could do it correctly. And I was right! The pasta was perfect. OK my cutting was a little clumsy but with a bit more practise I’m sure I will improve. But still I was proud of my efforts as I gazed lovingly at the delicate sunshine coloured ribbons with occasional deep red saffron flecks, hanging out to dry. Unusually for me I stuck to the recipe like glue, I wanted to feel safe and secure and although the pasta didn’t look perfect, the taste and consistency were spot on, which is the thing that counts as far as I’m concerned. I was wise to stick to the recipe because now I feel totally confident with my pasta making and maybe next time I can experiment a bit. Place the saffron threads in a bowl and pour over the hot water. Leave to stand for 10 minutes or more to infuse. Add the eggs and the oil and beat together. Place flour and turmeric in a food processor or large bowl and slowly add the egg mixture until a crumbly dough is formed. If you need more oil or flour just add small amounts at a time. You don’t want your dough to be too dry or too sticky. Dust work surface or board with flour and knead the dough into a ball and continue kneading until you have a silky soft dough. Wrap in clingfilm and chill or at least 30 minutes….but you can leave it in the fridge for up to a day. When you are ready to make your pasta chop the dough into 3 pieces wrapping the other two back up so they don’t dry out. Dust with a little flour and with a rolling-pin flatten the piece into a thinnish rectangle. 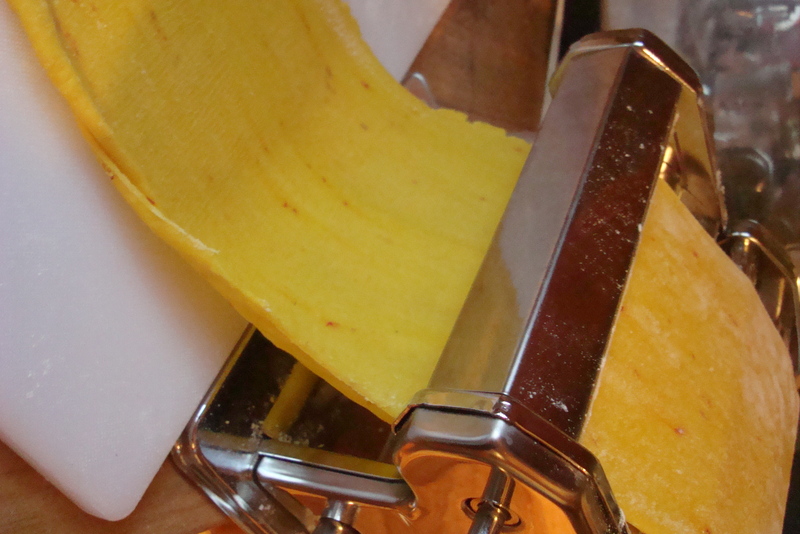 If you are using a pasta machine set the roller to the widest setting and pass the dough through. Keep doing this narrowing the setting each time and making sure the dough stays dusted with flour to avoid it going sticky. I didn’t narrow the machine to its thinnest setting as it seemed too thin for tagliatelle. 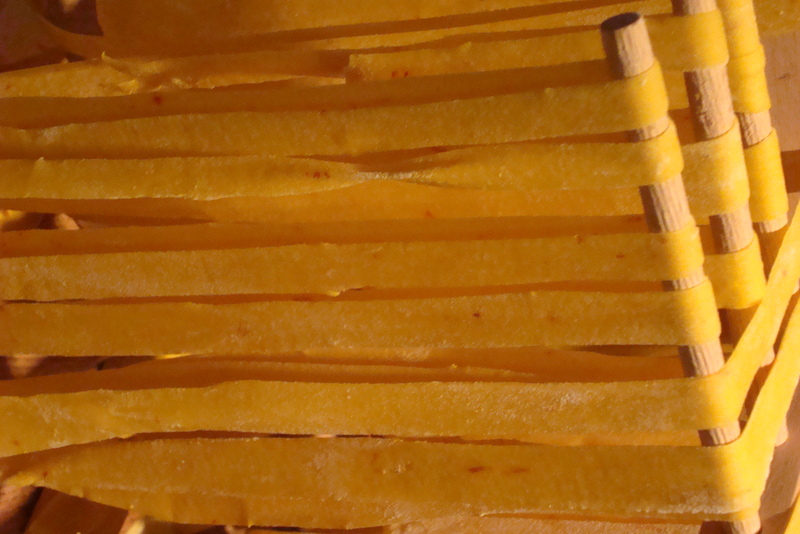 Fold the pasta sheet twice along its length making sure it is still dusted with flour and cut into long strips. Either hang to dry over a pasta hanger as I did or over the back of a chair. If you don’t have a pasta machine you can still achieve the desired thickness by some persistent rolling on a well floured board, all a machine does, is speed up the process. Repeat this process with the other two portions of dough. This recipe made enough pasta to feed the four of us…with a little left over so I guess it would probably feed five to six people. Leave the pasta for about 10 minutes before cooking in plenty of boiling salted water. It only needs a few minutes and then mix with a sauce of your choice. I used another Ottolenghi recipe, not entirely sure whether the kids would like it, but I wanted to try it anyway. Saute the sliced mushrooms in plenty of olive oil until just starting to turn brown. Add wine, bay leaves, thyme and sugar. Bring to the boil and simmer; the wine needs to reduce to about a third of the original amount. Stir in the cream, season with salt and pepper and keep warm. Mix together lemon zest, garlic and parsley. Keep to one side. In a hot dry pan toast the breadcrumbs until golden brown. Leave to cool slightly before mixing with the lemon mixture. Trim the broccoli and slice any extra think pieces in half. Blanch for a couple of minutes in boiling water then drain. 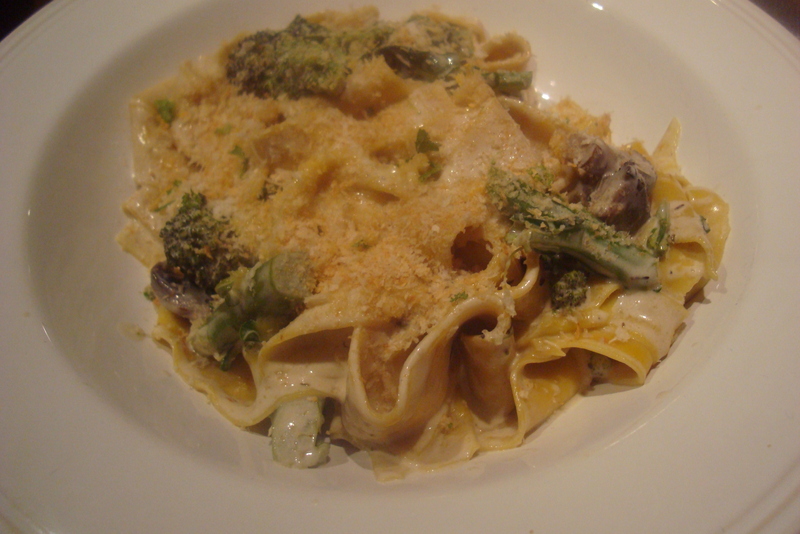 Cook the pasta in boiling water for a couple of minutes and while that is cooking mix the broccoli into the mushroom and cream mixture. Drain the pasta and mix into the creamy sauce adding a bit of the cooking liquid if it seems too thick. Divide between warmed plates and sprinkle over the breadcrumb mixture and serve. “Mum it’s really nice…it tastes like it’s from a restaurant”. We like soup in our house. In fact that is an understatement: We love it! Not just because it makes a quick, easy to prepare supper and is relatively cheap (very important as we head towards the end of January and we’re all feeling the pinch in our pockets), but also because it is damn tasty! 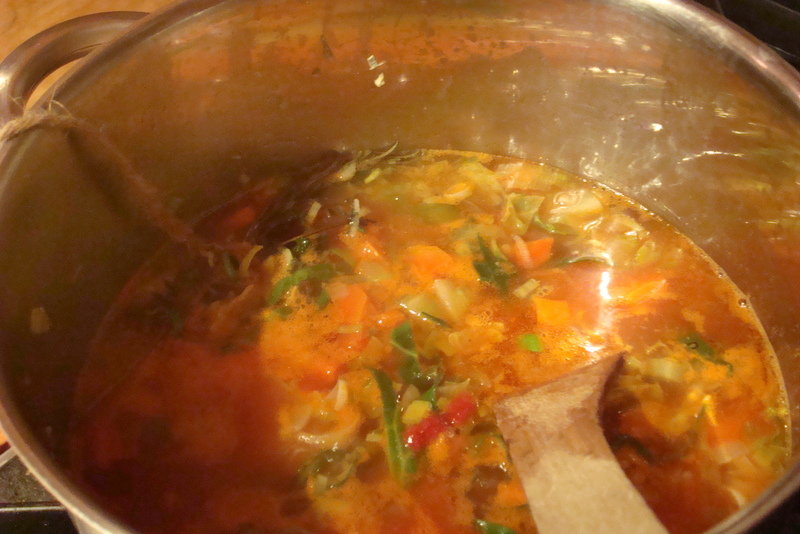 Kids love soup, even when they declare that they hate vegetables, I like it because it is quick to make, low in fat and stodge (unless of course you pair it with some lovely crusty bread with butter), filling and warming on a cold dark winters evening. 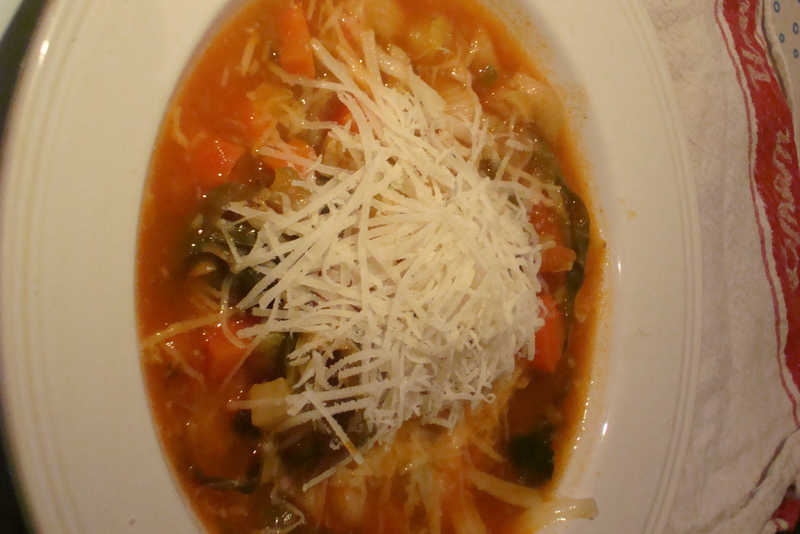 One of our favourite soups is minestrone. An Italian staple it is a peasant dish at heart that can pretty much be made with whatever you have left over, plus some pasta, beans or meat. 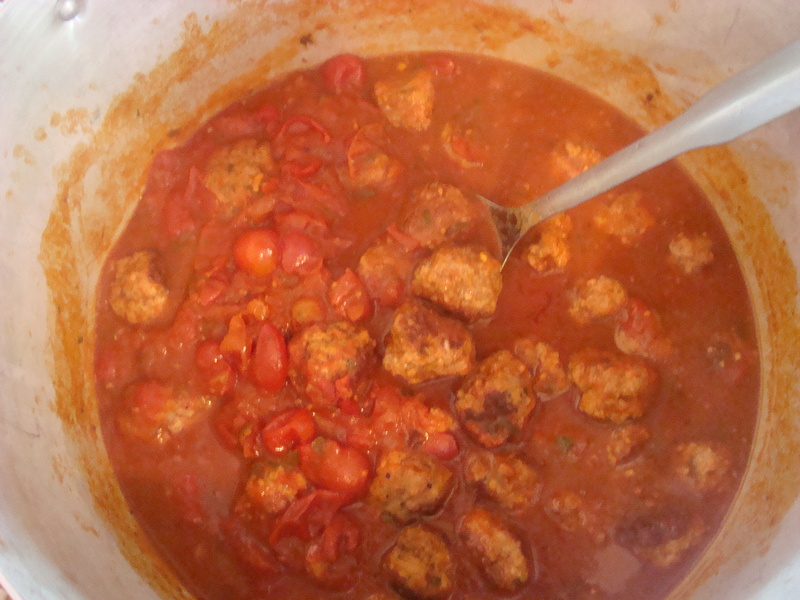 We have one vegetarian in the family so I like to keep the soup meat free….and then add more stuff at the end. Pour a good glug of olive oil (2 tablespoons or so) into a large pan. Add the finely chopped onion and celery and sweat gently over a low heat without browning for about 5 to 10 minutes. Add the carrot, leek, potato and garlic and continue cooking for another 10 minutes until beginning to soften, but not turning brown. Put the tomatoes into a bowl and cover with boiling water and leave until the skin begins to split. Remove and cool slightly before taking the skin off. Chop roughly. Add to the pan with the shredded cabbage, bouquet garni and stock mixture. Increase the heat a little and bring to a gentle simmer. Half cover with a lid and allow to cook for about 10 to 15 minutes. After this time add the pasta. 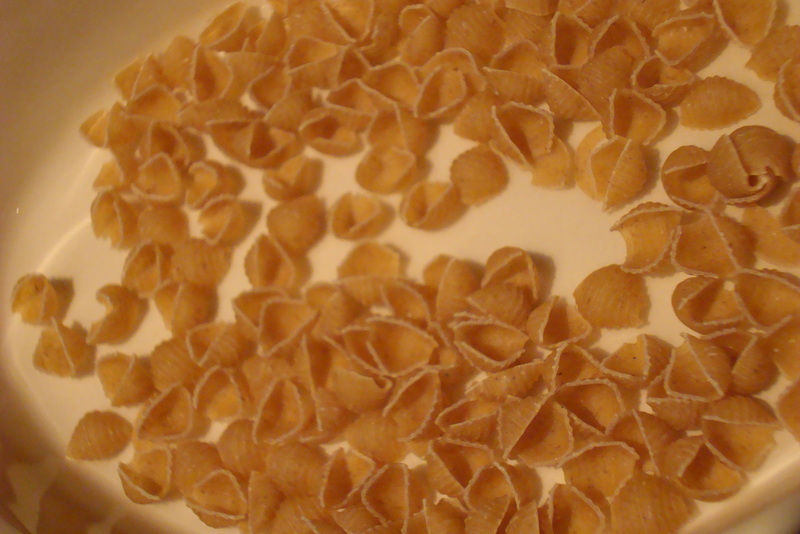 We used a soup pasta that looks like a tiny conchiglie shell (that conch shape) called conchigliette. You can buy it in most supermarkets or Italian delis, but any small quick cooking pasta will do…even macaroni if you are really stuck. You could also add cooked beans at this time as well. Any kind of white bean is good in this soup (haricot, cannellini) and will add more texture and bulk. If you are using beans you could leave out the potato. Leave to cook for a further 10 minutes or until the pasta is al dente. Add chopped fresh parsley and check the seasoning. Serve with some really good bread and if you want to make the dish less frugal you can top with a trickle of truffle oil, or a good covering of parmesan…or even some fried cooking chorizo (which I did). 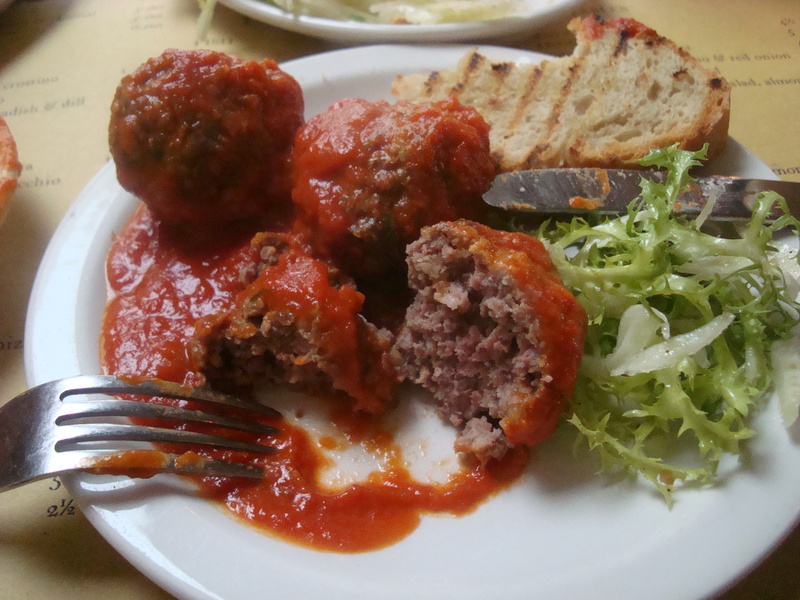 My recent lunch in Polpo reminded me of how much I love Italian meatballs, or Polpette as they are there. Polpette...with a bit of spagetti...even though I said I prefer them without! !..a hungry mother can change her mind can't she? 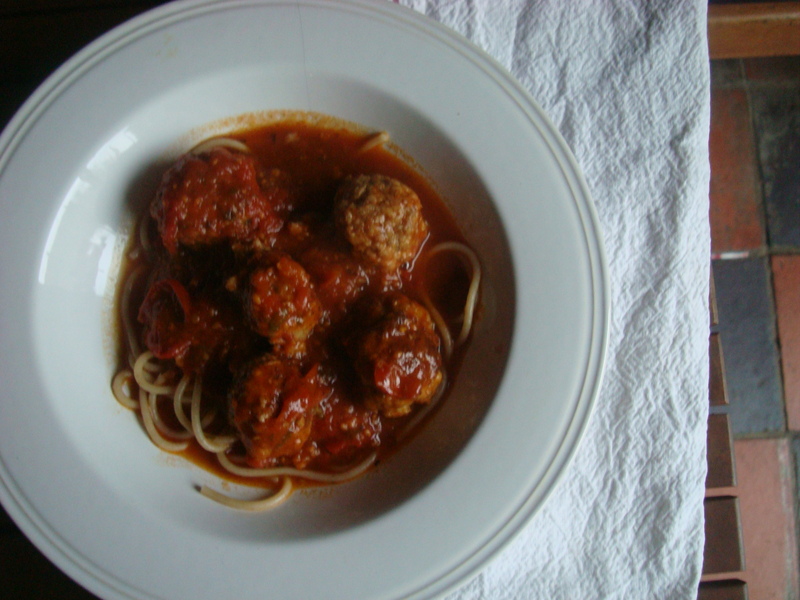 Meatballs are standard fare around the world. In Germany they are fried and called frikadeller or klopse and in Denmark they are frikadelier. In Indonesia and the Philippines they are more usually served in a noodle soup or broth. In Portugal or Brazil they are almôndegas and cooked in a tomato sauce. I have my own recipe for these yummy little meatballs which seems to include elements from all the countries, although mine are more akin to the Italian inspired ones I had at Polpo that came with a rich tomato sauce, the perfect accompaniment to my mind. Polpette are usually made with a mixture of beef and pork, bread soaked in milk and flavoured with a variety of ingredients such as onion, parsley, Romano cheese or garlic. They are commonly served as a second course with a salad, and not in the American style, with pasta. Having said this, serving them with pasta in Italy is not unheard of and I often do at home simply because the kids demand it! I love them simply because they are hearty country fare. No fuss. No need for unneccessary adornment. But these succulent little balls are also versatile. They are perfect for lunch or supper; they make me think of raucous family dinners sat around a large table in the sun, but at the same time they comfortably hold their own as part of a restaurant menu. Even better, it is just as easy to make a vat full for a large hungry gathering as it is to make a small amount for two. To serve six to eight with or without pasta. For the polpette: 2 thick slices ciabatta, 8 tablespoons milk, 350g minced pork, 350g minced beef, a good handful of chopped parsley, a handful of chopped fresh oregano, 4 cloves garlic, 1 large egg beaten. For the sauce: 2 tins of cherry tomatoes, 2 tablespoons of tomato or sun-dried tomato puree, 1 teaspoon sugar, 150ml of red wine, or water, 2 cloves garlic crushed. Chopped parsley and fresh oregano. Salt and pepper. Tear the bread into small pieces into a bowl removing the crusts. Pour over milk and leave for about ten minutes or so to soften. Add the pork and beef, half the parsley and oregano and garlic, salt and pepper. Knead well with clean hands to work all the ingredients together. There shouldn’t be any big lumps of bread left. Add the egg to bind and continue working the mixture together. spoon out about a dessertspoonful of mixture and form into a golf ball size/shape. Heat olive oil in a frying pan and fry the balls briskly until browned. Put to one side. Add all the ingredients for the sauce to the pan and bring to the boil squashing the cherry tomatoes into the sauce as you go. Once bubbling return the balls to the pan, turn the heat down low and cover. Simmer for about 30 minutes. Just before serving check the seasoning, then serve with a sharp lemony salad. This month we will using all the lovely seasonal produce available now to make some dishes synonymous with summer and those with an Italian / Venetian theme. Inspired by my lunch at Polpo I’ve made some changes to the menu originally suggested. We start with traditional strawberry Rossini cocktails, alcoholic fruit in a glass….and then there will be plenty of fresh herbs from the garden; some will marinate good quality buffalo mozzarella, then served with fresh and oak smoked local tomatoes (from Moelyci…simply the best I’ve ever tasted outside of France or Italy) …then I will making my variation on Polpette (either meat or vegetarian versions) served with a fresh fennel and pea and herb salad and some home-made rosemary and garlic topped focaccia. This will all be served family style so you can help yourself to more and more. We will finish with a hearty and traditional Loganberry vodka infused summer pudding with clotted cream. It’s not often I get to totally indulge myself, but on a rare free day (meaning no kids) during a visit down south to see my parents, I took a trip into the city for a lovely lunch, before a meeting with my writing mentor. It’s no secret that I miss eating out and that there is little opportunity for leisurely lunches back in Wales and since i’d read several glowing reviews of Polpo and sister restaurants Polpetto and Spuntino in the past few months I thought I’d pay the first of these a visit to check it out. I wasn’t entirely convinced I’d like the ‘small plate’ concept as usually my leaning is towards a good-sized serving of hearty country fare, but since none of the reviewers appeared to have left the place hungry I guessed I should put my faith in their comments. 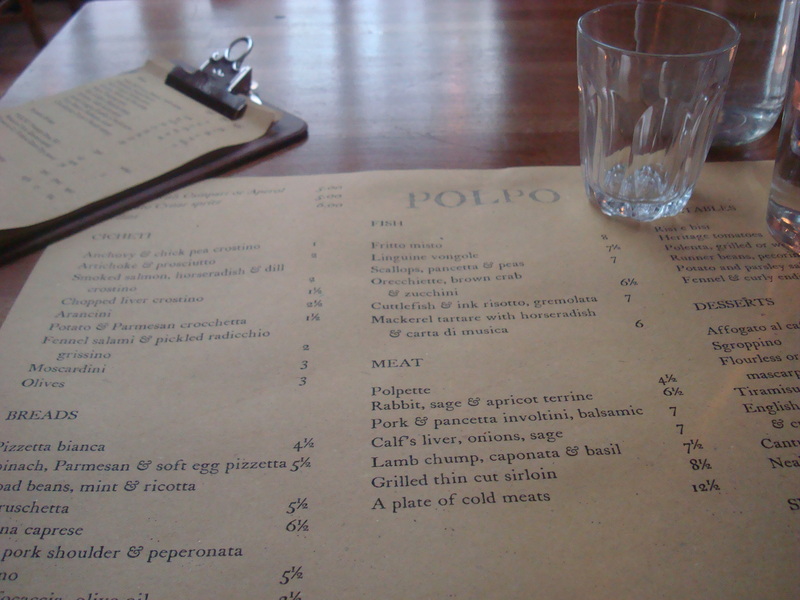 Polpo is beautifully laid back and full of understated style. Modelled on the traditional Venetian bacaro but housed in a traditional 18th century London building, it exudes its own rustic charm. My table faced a pretty little internal courtyard, bathed in sunshine and overflowing with scarlet geraniums I could almost have been in Venice. Well maybe not, but it certainly succeeded in reminding me of some of the places I visited when I was there many years ago. Thankfully I got there early enough so that I didn’t have to wait for a table; fifteen minutes later the place was packed out. The young friendly waiters and waitresses were attentive and helpful and very ready to answer my questions “what are polpette”? 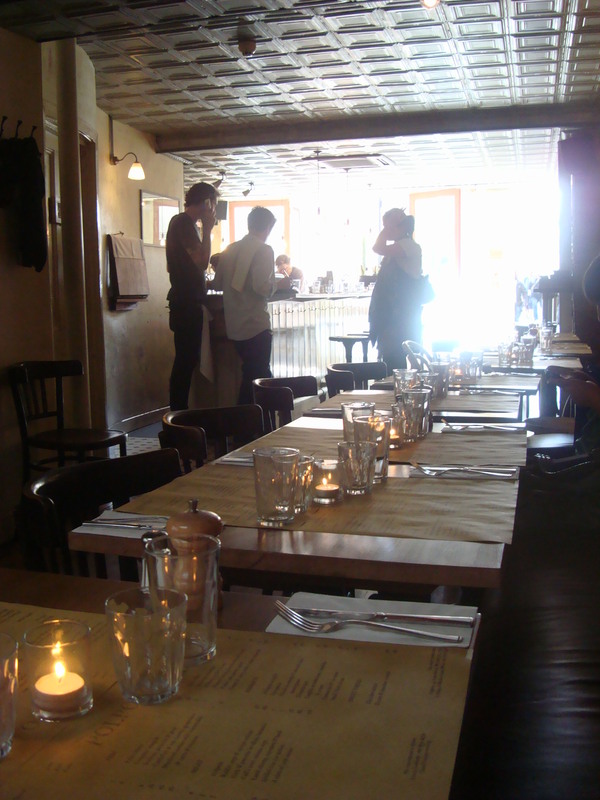 and the menu was adequate without being too extensive. 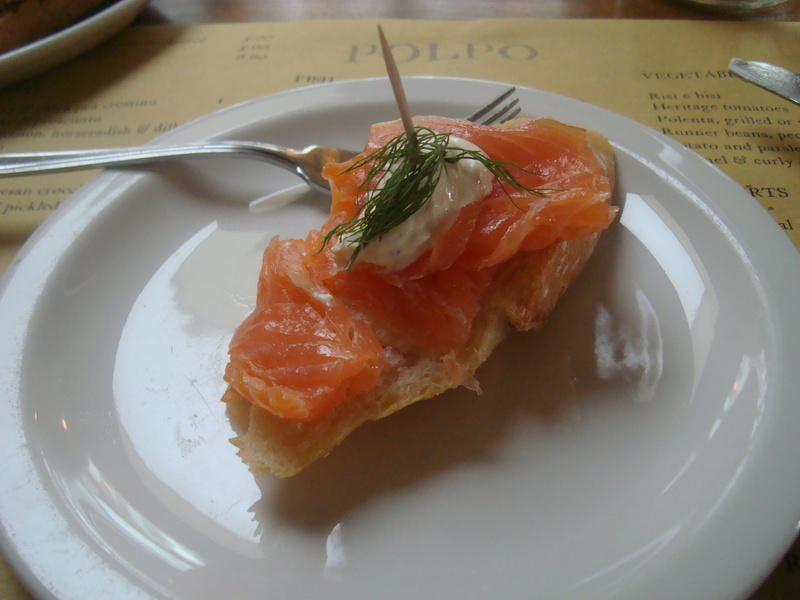 I ordered smoked salmon, horseradish and dill crostino to begin and then Polpette (meat balls), fennel and endive salad with almonds and some grilled focaccia to follow. I wasn’t sure how big the small plates would be so I erred on the side of caution not wishing to leave hungry! In the end I found that I had over ordered and couldn’t manage the last piece of focaccia. I was pleasantly surprised at the good chunky crostino with its generous helping of smoked salmon and the dollop of horseradish was as I like it, creamy and with a kick, but not too overpowering. The polpette were deliciously rich and tomatoey, tender and juicy while the fennel and endive salad was sharp and fresh. The two complimented each other beautifully and I really didn’t need the focaccia, which was the only disappointing thing about the lunch. I like a chunky, earthy focaccia liberally strewn with rosemary and garlic, which is how I make it, while this was a rather thin and more ciabatta like bread. I'm a rubbish food photographer...my stomach got the better of me and I layered everything on to my plate before I photographed it!! 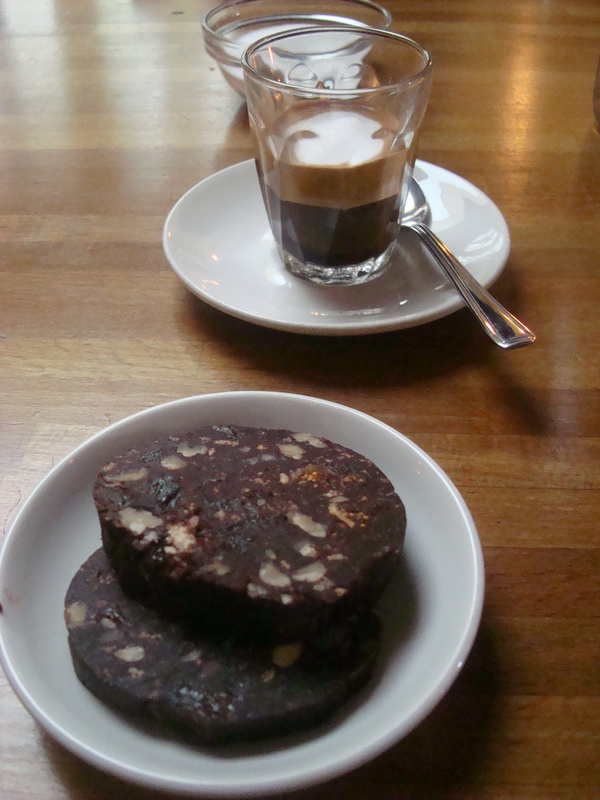 While I still had time to spare I finished with a Machiatto and some chocolate salami, one of my favourite coffee accompaniments and one not often seen on restaurant menus. The waitress and I had a long conversation about it and I ascertained that this was a sugarless version made with figs. It certainly wasn’t as sweet as when I make it using cranberries or cherries, but was just as nice, with its slightly salty, earthy taste derived from the nuts and figs. It went very well with the dark chocolate and coffee. Russell Norman and Polpo definitely won me over and gained another fan. I have to admit that it really wasn’t a hard job; I am already a lover of good Italian food and all they had to do was give me that and plenty of it. I want to go back. I want to take friends, but I will now have to wait until my next visit to London to try one of the other restaurants in the group. I can’t wait! My lunch cost me £20 for 3 courses and coffee. This included service. Bookings can only be made for lunch.